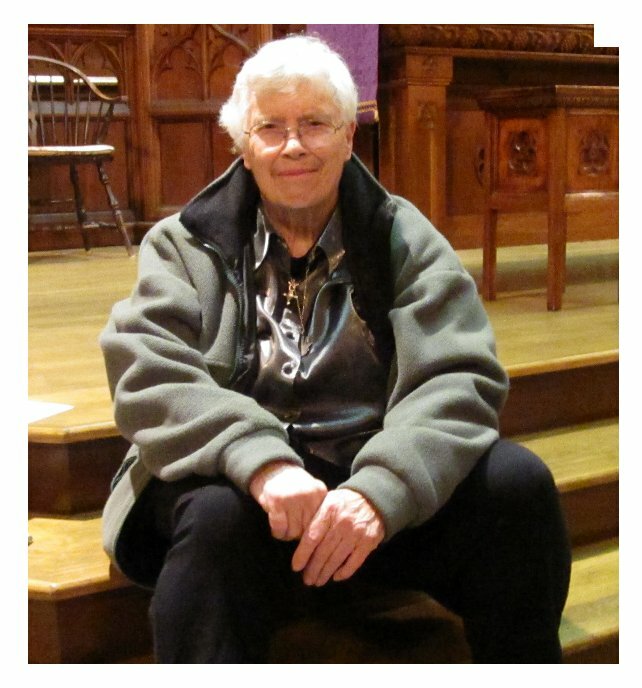 Pauline Oliveros Interview with Bruce Duffie . . . . . .
PAULINE OLIVEROS is a senior figure in contemporary American music. Her career spans fifty years of boundary dissolving music making. In the '50s she was part of a circle of iconoclastic composers, artists, poets gathered together in San Francisco. Recently awarded the John Cage award for 2012 from the Foundation of Contemporary Arts, Oliveros is Distinguished Research Professor of Music at Rensselaer Polytechnic Institute, Troy, NY, and Darius Milhaud Artist-in-Residence at Mills College. Oliveros has been as interested in finding new sounds as in finding new uses for old ones. Her primary instrument is the accordion, an unexpected visitor perhaps to musical cutting edge, but one which she approaches in much the same way that a Zen musician might approach the Japanese shakuhachi. 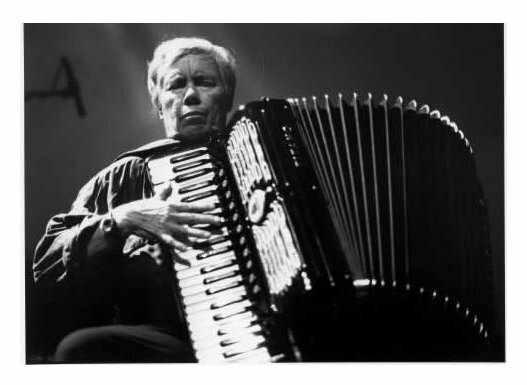 Pauline Oliveros' life as a composer, performer and humanitarian is about opening her own and others' sensibilities to the universe and facets of sounds. 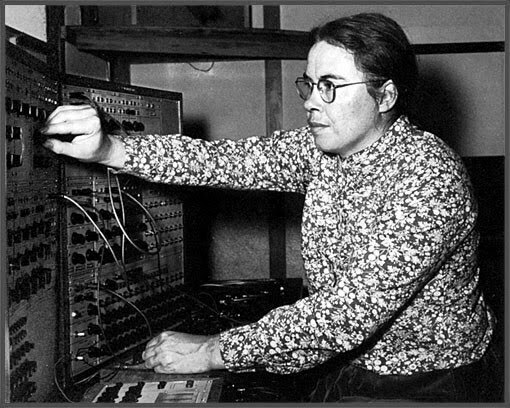 Since the 1960's she has influenced American music profoundly through her work with improvisation, meditation, electronic music, myth and ritual. 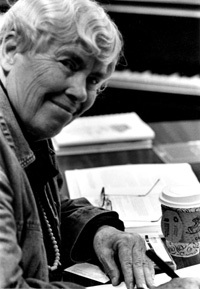 Pauline Oliveros is the founder of "Deep Listening," which comes from her childhood fascination with sounds and from her works in concert music with composition, improvisation and electro-acoustics. She describes Deep Listening as a way of listening in every possible way to everything possible to hear no matter what you are doing. Such intense listening includes the sounds of daily life, of nature, of one's own thoughts as well as musical sounds. "Deep Listening is my life practice," she explains, simply. 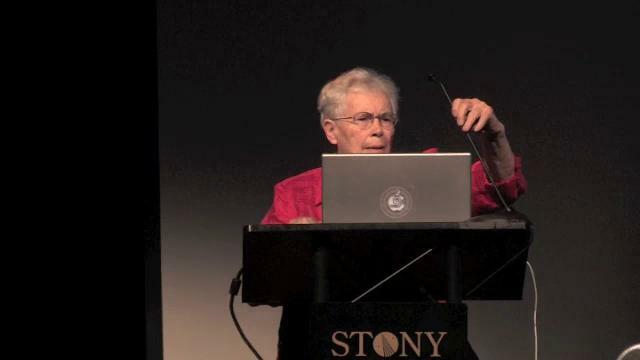 Oliveros is founder of Deep Listening Institute, formerly Pauline Oliveros Foundation. We begin with her eponymous project . 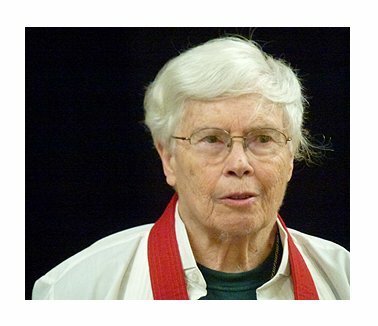 . . . .
Pauline Oliveros: It's a nonprofit organization, and it's a program for the arts. PO: Yes. The mission of the foundation is the creation of new work in a new medium for artists and collaborations, with dissemination via our mail order catalog through presentation and education of the public about new work. It's different from traditional organizations in that that's our focus. Artists very much need a platform and a community. 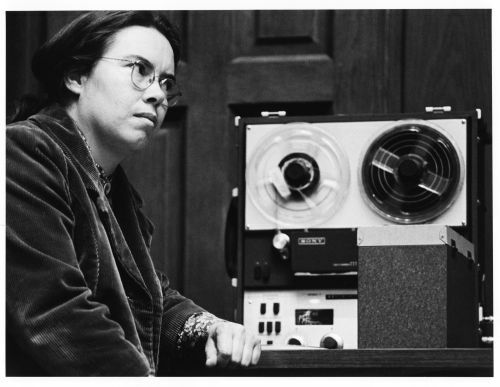 In 1960 I was involved the founding of the San Francisco Tape Music Center, and that organization really is one of the first, or a prototype alternative organization for composers needing a place to work. At that time it was electronic music, which had no platform at all. BD: Have you tried to get other electronic composers involved in this, or composers of all kinds? PO: You don't have to be categorized. Technology is part of our mission, as well as supporting other projects, but you don't have to be a "this" or a "that." You need to work on projects that are breaking new ground. BD: With all the time that you are promoting this new foundation, are you still composing yourself? BD: How do you divide your time amongst all these taxing activities? PO: [Takes a breath, then speaks with honest, resigned bafflement] Well, I don't know. [Laughs] It seems to be a call. As I said, the San Francisco Tape Music Center was very important to me as a young composer, and it gave me a platform and a place to launch my work. I don't know where I would've been at home without that. As I have gone through several decades of creative activity, I felt that it was important to resign from my university job and to create my own organization, to do just that. BD: Are you creating your own little university? PO: I don't think of it as a university! I think of it as community. BD: So then you're more of an impresario? PO: No, I don't think of myself as an impresario, really. BD: I'm sorry that I seem to be trying to find a pigeonhole for you. PO: I know! There really isn't one, and I keep trying to jump out of those pigeonholes because I feel that the kind of context that we need keeps changing. As soon as you get comfortable in a category, it starts to lose its charge and its vitality. It also just doesn't really deal with the issues that are at hand. BD: So what are the issues that are currently at hand? PO: It's the great dispersion that I predicted in my book Software for People, which was that the two factors were the great increase in population — there more people than there ever have been before — and the acceleration of new technology. You really don't know what's coming next, exactly. Everyone is always trying to predict and control the future, but I don't think it's possible at this time because there are just too many X factors. BD: So you and your foundation and your music are building the future brick by brick? PO: Yeah, I would say something like that; or we might take some leaps! But the idea is that we need a context for new work, because it has to do with the quality of life. It has to do with problem solving, understanding the creative nature of the human being, and working with it and accepting it; finding ways to do that. Not just repeating things that have been done before, but to bring some kind of balance in place for the unknown. BD: Is it at all disappointing that the public isn't craving the unknown in music? BD: There seems to be less of a clamor for new music than, say, for new cuisine or new films. PO: Music has been a very conservative force, and the reason, I think, for it is that people have not been given the opportunity or encouraged or catalyzed to make their own music. The issue is making music creatively, creating one's own kind of music out of whatever materials there are and whatever needs there are. You find that in pockets, but in establishment music schools, what do you find? You find people learning how to play instruments to perform music of the past for the most part. BD: [With a gentle nudge] You're not suggesting that we lose the past, are you??? PO: No! But why do we have to do it so much?!! BD: So you want the past in conjunction with the present and the future? PO: Yes, exactly. Let's have some balance!! Why do we have to have all these repetitions? There is no opportunity for creative work by musicians... or very little. BD: Even with very little opportunity, are you encouraged by what creativity is going on these days? PO: Yes. I think that there is quite a bit. But still, if you look in the newspaper or listen to the radio stations, what do you hear? What do you see? Where are the results? Where is it made available? Where are people educated about it and given opportunities and support? BD: When you're writing a piece of music, are you concerned with the public that is going to hear it, or are you concerned with the sounds that you are producing for yourself and for other composers? What goes through your mind? PO: It depends on the situation. A lot of my work in the past 25 years has been concerned with forms that invite participation by all kinds of people. So if you ask me whether I'm concerned about the audience or the sounds, I'm concerned about both! Also I'm concerned that it be possible to give an audience not only some sounds or some guidelines to work with, but really an experience that is undeniable! BD: We're dancing around the question, so let me hit directly. What is the purpose of music? PO: I always liked John Cage's answer to that, which is to open the mind to divine influences. That's a good one, but I do think that music is a vehicle for the expression of the soul. It has lots of different functions. We think of music in this society as entertainment, which it very well may be. There's nothing wrong with entertainment, and good entertainment at that, but it can have other purposes. It can function as a healing force; it can function as a way of journeying inside and finding out something about oneself; it can be an intellectual game; it can bring emotional support to people who need it; it can help in therapeutic ways; it can just be itself, it can just be music! BD: Music for its own sake? PO: Yes, I guess you'd say. BD: Or is it music for people's sake? PO: Music and people go together; they are not separate. How could it be? BD: Like the tree falling in forest if no one is around, if a work is performed and there's no audience, is it music? PO: If there's a performer then there's an audience. BD: I see, an inward audience. BD: But I would assume that mostly you would want an outward audience, also. PO: Not necessarily. It depends on the use of the music. There's plenty of music that's played only for the person who's playing it! And why not? A large audience comes out of this 19th century grandeur. It wasn't always so. BD: As a composer, would you not like your music to be heard by as many people as possible? PO: Sometimes it's more powerful for music to be heard by a few people, and then to have that situation happen often is very nice, but then you have more people. Sometimes it's possible to work with a large audience, but the larger the audience the less the detail in the reception of the work. BD: Before the tape machine was running, you mentioned that you're now going on the World Wide Web. Is this the ultimate in individual audiences, to have music for each individual computer user? BD: So you're wanting to get the same impact in cyberspace that you would in a live performance? PO: The same impact in cyberspace as in real space? [Ponders a moment] I don't know for sure because the impact in real space is different according to the real space and who is there and what is being performed. There are so many variables and factors to take into account. BD: Is this something that you could build in to your music? Could you program it with the idea that you could select a known concert hall in San Francisco or in Chicago, or an unknown space at the top of a mountain in Colorado? PO: That's a beautiful idea, and data structures already exist for those kinds of possibilities. I have a great interest in these different spaces. BD: In the print medium you can select your background. Now in the aural medium, you can also select your background. PO: I don't exactly think of it as background, just to point this out. I'm thinking all the time of the space that I'm performing in as the partner in the music. That's very important to me, so that's why I picked up on your idea right away. That's essential. You've been working in radio space for a long time, so when you play music on the radio, what are you thinking about in terms of how it's being received out there? BD: I know that it's going to be received differently by someone listening on a small radio in a bedroom, or on a large radio in a living room, or in a bigger set that was perhaps a gathering of many people at a party. Each system is different and the room is going to be different. PO: Exactly. So it's a very, very interesting situation. You send it out, but the reception of it is going to be different for each of the maybe thousands of people tuned in at the same time! I wonder what it would sound like if you could hear that all at once... [Both laugh] I grew up in radio land. Hearing music on the radio was extremely important to me all my life. Hearing the New York Philharmonic and the NBC Orchestra with Toscanini, and the Metropolitan Opera, and all of that. It was a huge part of my education! BD: When you're composing a piece, would you specifically design it differently if you knew it was only going to be performed through loudspeakers rather than with live people in a concert hall setting? PO: Certainly, I would. I would try to take as much into account as possible about the way something was going to be presented. Here we are at the end of the 20th century, with all these means of transmission and performance, and it's a little bit mindboggling when you start to think of the ramifications of it and the different cultures of it. By that I don't mean different geographical locations; I'm meaning just a person who is of the culture of radio or of television or of the concert hall, or of car radio. All these represent to me different cultures. BD: Do you expect a certain level of sophistication on the part of your listeners, or does it matter to you? PO: That depends. If they have no reference points, then it could be pretty hard at times. BD: So is your music for everyone? PO: No! It doesn't seem to be. [Bursts out laughing] Otherwise, I would be as popular as Bruce Springsteen or The Smashing Pumpkins. [Both ponder that idea for a moment] I seem to have a reputation, to be known by people in a network throughout the world, but it isn't the network of everybody. BD: Would you want it to be everybody? PO: If everyone could participate and appreciate it, yes I would. If it were beneficial for everyone to appreciate it and participate in it, I would like that. BD: Is all of your music either notated or placed on the electronic spectrum, or is some of it left to chance as in the Cage music? PO: I've been at it now for 45 years, so there's a lot of different resources that I use. Again, it refuses to get too categorized because it'll change! BD: That means you are looking to do different things all the time. PO: Yeah, I am. I am looking do that, and to change myself through the process of change. BD: Is it change to improve or just change for change's sake? PO: It's change to deal with the issues and conditions that are met. BD: Do you change as the world changes? PO: I don't know if I could say that or not! BD: If you write a piece for a certain time, does that get lost when the time moves on? PO: I have some pieces that are obsolete! [Laughs] I mean "obsolete" in the sense that it uses referential sounds and things that are no longer very present in this culture! BD: But at least some of us still have that history within us. PO: Yeah, well sure! But the younger people don't! For example, in one piece that I wrote in about 1964 called Pieces of Eight was a theater piece for eight wind instruments, and it had a lot of props in it. Some of the props were a little on the antique side at the time, including a weather vane and a balance scale and particularly a cash register. BD: [Imitates the sound of an old mechanical cash register] Ka-chunk! PO: Ka-chunk! Bing! [Both laugh heartily] You don't have those any more except in a very rare specialty shop. BD: Should you do a new version of that with a modern scanner? PO: That's not the same! The culture of that piece needs to stay there and not be revised and updated into this particular time. BD: Is there, perhaps, a direct relationship with dialing a rotary phone [imitates the sound of dialing a rotary telephone] shoo-oo--WHEE--tick--tick--tick--tick, and how it would be now with a touch-tone [imitates the rapid-fire sound of a touch-tone telephone] bee-ba-buh-buh-buh-ba-beep? PO: That's right. Each player had a wind-up alarm clock they would ring, but it was a mechanical alarm clock, not an electric one that would beep! [Laughs] All of those things are references to a former time! BD: Shouldn't we enjoy that now? PO: I think it could and it can be done. You could enjoy it to hear the sounds and get the fun of the references, probably, but young people who have no experience with any of those things might be a bit curious. BD: But we're all presumably taught history in school. If we know the history of this century we know World War I, the Depression, FDR and Harry Truman and all of this right up to today. PO: It's interesting that these things in the '60s had a referential meaning that at this time would be somewhat different. So I say it's obsolete in a sense. BD: But it wouldn't be obsolete like a political reference to Nixon's dog Checkers, or something like that. PO: No, It wouldn't. It was actually kind of a piece that was my way of dealing with conductors. As my music evolved over the past 20 or 30 years, I've made a lot of pieces that dispense with conductors! This theater was a kind of spoof on conductors, who they are, what they do and how they function! BD: When you get rid of the conductor are you then expecting more out of the performer, or are you just cutting them loose? PO: I'm expecting the performer to be responsible and accountable for their part! BD: Are they responsible for recreating what you have written, or are they responsible for putting their own input into it also? PO: In my work, what is involved is a partnership with the performer, which gives the performer creative decision making possibilities. BD: Within parameters, or without parameters? BD: How tough are the guidelines? PO: Tough enough. They seem very simple, but they are very deceptive in terms of the simplicity. As an illustration, I have a piece that's called The Witness. [The Witness (1980), for soloist and an imaginary partner or ensemble of up to 100.] It has three options in it that have to be developed over time in the piece. The first option is that the player is free to make any sound, but each succeeding sound has to be absolutely unique and different from any of the sounds that preceded it. So that's a simple instruction. BD: That guarantees that each performance will be unique into itself! PO: Of course, but more to the point is the fact that the performer is confronted with a very complex problem to solve, and is free to solve it however he or she can! You make a sound; the next sound has to be different and it has to be unique! Not the same sound that was made before, and not related to the sounds that were made before when you have moved in time. It may be that ten minutes go by and you hear three sounds if it's done correctly. Then there is another section to the piece with another instruction and another, so it's actually quite demanding of the performer. But also it's a partnership in terms of their creative work. BD: It sounds like you expect a lot of your performers. BD: Should you be listed as composer, or just "guider" or "leader." PO: I don't care! [Laughs] I'm gettin' so I don't care whether it's "composer" or not. It's another label. What is a composer anyhow? BD: Let me turn the question back to you. What is a composer? PO: There are all kinds of definitions, but I think a composer organizes the sound in the piece, or organizes the events, maybe. There's all kinds of different ways that you can approach it, but what I'm organizing is the strategy and the way that the performer is asked to direct attention or manage attention. This is a different level of understanding, in terms of creating a piece of music. BD: Have you basically been pleased with the performances of your works that you've heard over the years? PO: [Takes a deep breath] Not always, no. Sometimes I'm very displeased, and say so! I'm displeased if the instructions or guidelines that I give are disregarded! Then it's not my piece; it's somebody else's piece, and that's okay, but I would rather that my piece be withdrawn and that person goes ahead and makes their own piece and calls it theirs. BD: In terms of disregarding your instructions, how far is too far? PO: Suppose you gave a piece which was in conventional pitch-rhythm notation, and the performer looked at it and said, "I think I'll play some other notes here and play a different rhythm there." It's the same thing! BD: Sure! But in your pieces you are allowing much more freedom of interpretation and input from the performers! PO: [Chuckles] There still is room for interpretation. They have to interpret the work. They have to interpret the pitch and the rhythm, but there is a common practice that is agreed upon. There is a performance practice that is inherent in the work that I've done and do, and that probably has to be transmitted by me to the performer. Later, if performers have got it — and there are certainly performers who have learned my performance practice — then they can transmit it, too. But this is true of any music anywhere in the world. It doesn't matter whether it's written in notes or transmitted orally, or what. BD: Can one assume that you're basically pleased with the recordings that have been made, especially since you've supervised some of them? PO: A lot of the current recordings I'm performing myself. BD: So they take on an air of authenticity? BD: Does that in any way put straitjacket on future performances of them? PO: Not necessarily, because other performances would be different, probably. BD: What about 100 years from now when someone says, "But Pauline was on this recording, and that's how she did it. We must do it that way"? PO: Too bad. [Much laughter] I hope 100 years from now there will be something else going on. BD: You don't want your music to last??? PO: I don't know if it's necessary for that to happen. BD: Do you want it to disappear, or be only in a history book on the shelf? PO: No, I would rather that the principles and essences of the kind of practice that I have shown would be what is transmitted and appears later, not necessarily the notes. BD: So you want to be built upon. PO: Sure! I'm hoping that this is a kind of seed-like work that brings about discovery and exploration in other people, not necessarily the preservation of a sequence of notes that I might've put down. PO: Music is very resilient! Music will be! It'll always be there, one way or another. BD: What advice do you have for composers coming along? PO: Everything. Listen to everything, even the smallest, faintest sounds. Listen to sounds, listen to music, listen to everything — the environment, everything that's going on. BD: So then, as Cage said, everything is music. PO: It is, if you're listening to it that way. But if you're not bringing your consciousness and identifying it as music, it's not! BD: So if someone is swinging a hammer and pounding a nail, it might not be music to them, but if I'm listening to it for the rhythm and for the sound of the hammer hitting the nail, it can be music. PO: Of course! Why not? BD: So beauty is in the eye of the beholder, and music is in the ear of the beholder? PO: Music is in the ear of the listener! It has to be. PO: Again, it's about listening. [Pauses a moment] It's about letting go of whatever baggage you bring with you. If you go and hear Mozart and you're a fan of Mozart, then you should go with your Mozart ears and listen that way to get pleasure of that way of listening. But if you're going to hear something that is a new work, then it's good to go like a baby — open and ready to hear whatever's coming at you! PO: [Thinks for a moment] Yes, it's fun, but not always. You might have a pretty tricky problem to solve, and it takes a lot of thinking; it's elusive and you have to come back to it. That's not necessarily not fun. Sometimes if you're wanting to get something done and the solutions are not coming as quickly as you would like, that's not so much fun. But that just has to do with patience. BD: Eventually are you able to solve everything? PO: [Thinks again for a moment] Let's say that I go towards that. I go in that direction if possible. BD: Is that, perhaps, an unfair question because you are the one who is posing the problems? PO: I guess mostly that's true, but sometimes you're asked to do things by others, so they are then proposing some problems for you, too. BD: Thank you for coming and sharing everything. I appreciate being able to speak with you today. PO: You're welcome. Thank you for coming here and doing this. I appreciate it. This interview was recorded in Evanston, IL, on April 15, 1996. Portions (along with recordings) were used on WNIB in 1997, and on WNUR in 2003 and 2008. This transcription was made and posted on this website in 2012.